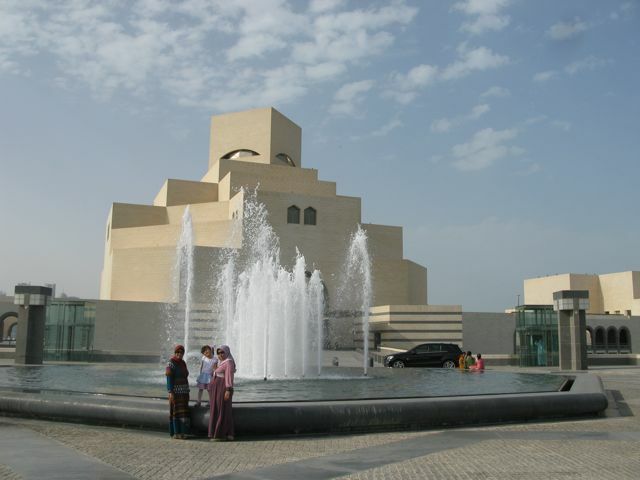 In 2009 I wrote about a visit to Doha. The Museum of Islamic Art had just opened. It’s a jewel of a museum and they feature a lot of antique jewelry. I am back in Doha for my 6th annual visit. Some things have changed. The license plates on cars now display Western numerals rather than Arabic numbers. The finished skyscrapers now outnumber the cranes in some parts of the city, but the building boom is still ongoing. This is still a place of unbelievable contrasts. 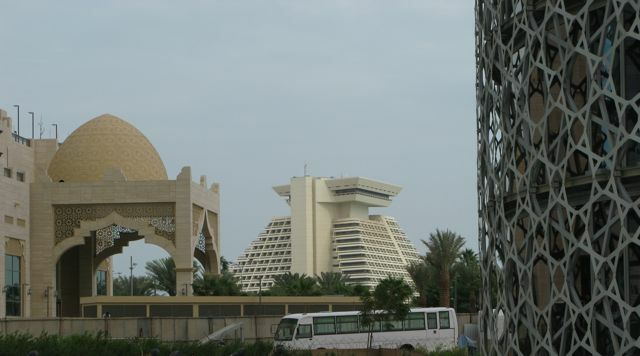 Hodge podge of styles: (from L>R) local traditional, modern (Sheraton pyramid) and base of an ugly tower with a metal laced exterior (see below; Burj tower), which I call the ‘corndog’ building because it looks like a corndog! First there is the architecture. I think this is a city with some of the most unsightly and strangest skyscrapers I have ever seen. But, also, with one of the most beautiful buildings in the world, the Museum of Islamic Art designed by IM Pei. It is truly mesmerizing. The Museum was meant to look like a veiled woman who’s ‘eyes’ are keeping watch over the city. Perhaps the most striking contrast is in the wealth distribution. Qatar is considered one of the richest countries on the globe. Qatar has a resident population of 1.7 Mio according to the 2010 census. However only 1/5 are Qatari nationals. The rest are ‘guest workers’, a euphemistic term. They get a resident permit when they enter the country, being invited by their sponsor, the business that employs them. Most have a single exit visa. Their sponsor (or employer) dictates when they exit the country and often they confiscate the employees passport. If fired, you are simply brought to the airport by your employer, end of story. Some guest workers are luckier and have multiple exit visas usually valid for one year. Some guest workers (but not all) also get a Health card, which gives them access to government subsidized health care. They may also acquire a liquor license but they have to be non-Muslim, a resident of Doha and earn over QR 4,000 per month. Most recently, those with liquor licenses can now also purchase pork products! Guest workers or expats come in different types. Top echelon expats are technical advisors, engineers, consultants, scientists and doctors. They are well paid. Their employer covers the rent and the school tuition for their kids. These people can make money here and save money, but they can never become citizens or start their own business. So most of them ultimately plan to move back home. More commonly expats do all the menial jobs. They come from all the countries around the Indian ocean. I try to speak to them. They are maids, hotel employees, cooks, cab drivers or personal drivers, and droves of construction workers. Their salaries are meager compared with western nations. My driver from Nepal makes 1,000 rial per month (US$ 275), that is 30 rial per day (US$ 7/day). Construction workers may make even less (700 rial/month), and a housemaid, depending on her employer, (700-2000 rial/month). Never the less, these salaries are a step up from what they could earn at home if they found a job. They are often able to send some money home and even support their families. One house keeper put her daughter through school, at home in the Philippines, with $250/semester while making about $400/month here in Qatar. My driver has lodging provided by his company: 14 men in 7 bunk beds in one room. Three are from Nepal and the rest are from Sri Lanka and India. Three are Hindu, the rest are Muslim. Life is not cheap in Doha and their salary is just sufficient for some food. He and his co-workers from Nepal are eager to return to their home country even if that means less money and possibly no work at all. It is interesting to draw this comparison: my driver makes 30 rial per day and my hotel room costs 1,100 rial per night! Is this human exploitation? It sounds like a medieval society. But am I not taking part in this? I come as a teacher and I share my knowledge in the hope that it will better the human condition, but ultimately I also come here because I am paid! By contrast, the new found oil and gas wealth of Qatar, deemed the richest country in the world for 2012, has also been used to do some amazing things. Related to my line of work, the Qatar Foundation invited several western universities to establish a campus in Doha. This started in the 1990s and now there are at least 7 campuses in Doha representing an unrivaled center for education in the Arab world. 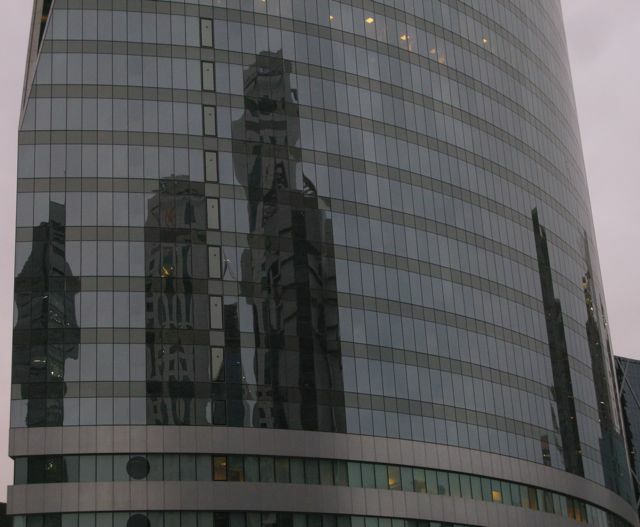 They include the campuses of Northwestern University (communications, journalism, liberal arts), Carnegie Mellon (business administration, computer science), Virginia Commenwealth Univ. (design, arts, fashion), Georgetown Univ. (foreign service, politics), Texas A&M (engineering), Weill Cornell Medical College (medicine) and University College of London (museum curation, archeology). The vision and origin of the Qatar Foundation comes from the Emir himself and particulary his wife, Her Highness Sheikha Moza bint Nasser. It’s mission is to further education, science and research, and community development. So much for contrasts. Back to jewelry. 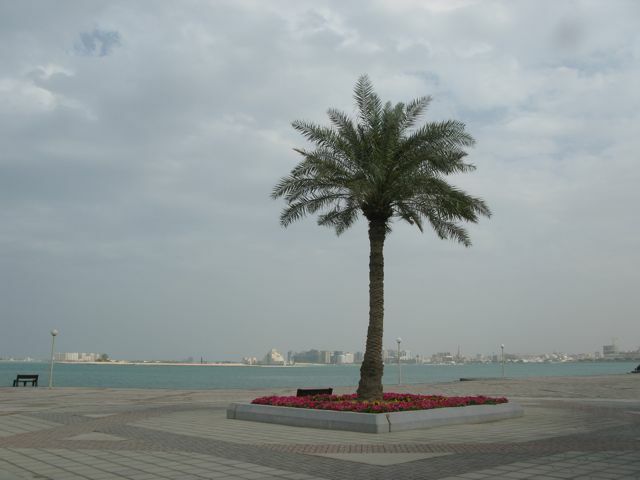 I took a long walk just yesterday from the hotel to the museum along the Corniche. I met a few fishermen. 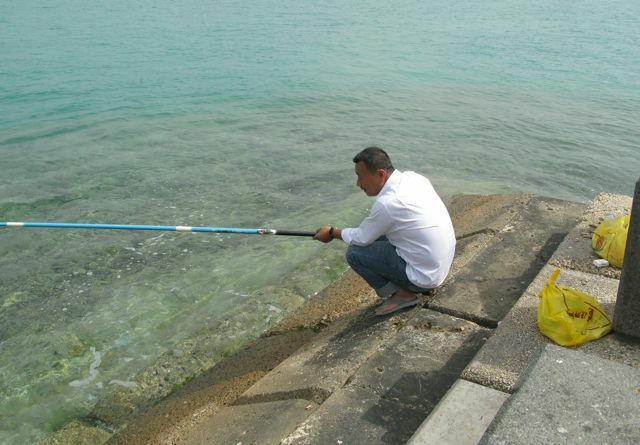 One man from China had caught 10 fish. 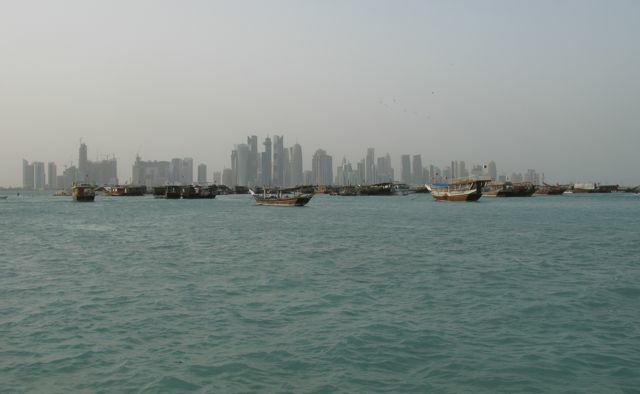 The gulf is actually rich in fish and Doha has a very old history of fishing trade. 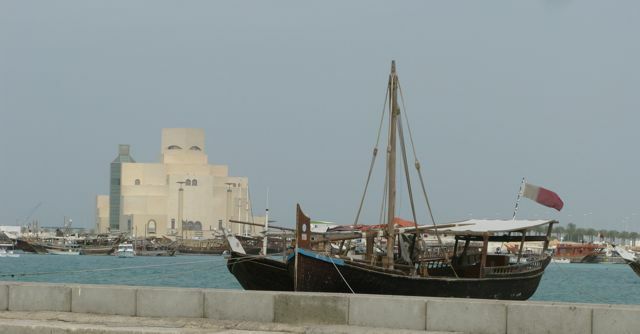 From afar you can see the Museum of Islamic Art built on a man made peninsula. From close up the contrast of old fishing boats (dhow harbor) and the modern art museum are striking! There is an extensive review of shipping and ship construction in the gulf at catnaps.org – where there is plenty on Islamic design and traditional boats. The entrance to the museum is a long drive way lined with palm trees, with water flowing down a central trough made of black marble. It is a stunning approach. Here are some pictures I took at the museum. These are items that belonged to royalty of course. 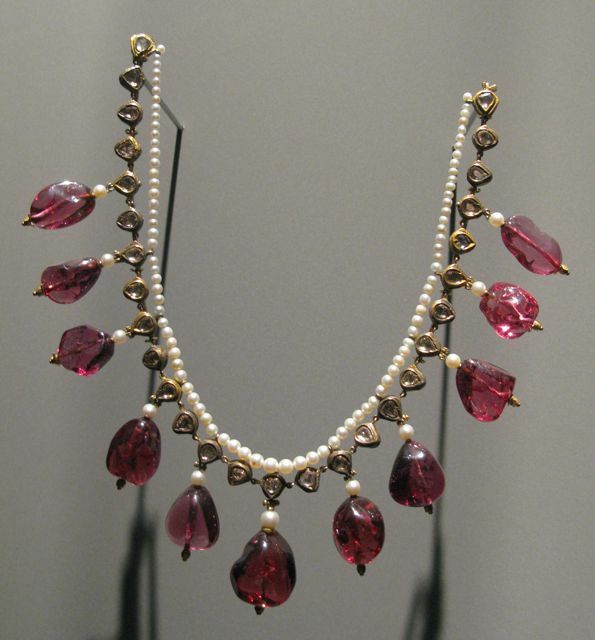 Necklace make of red spinel, pearls and diamonds set in gold bezels. A bazuband to be worn on the front of a princess, made of large diamonds set in gold with a spinel drop in front. 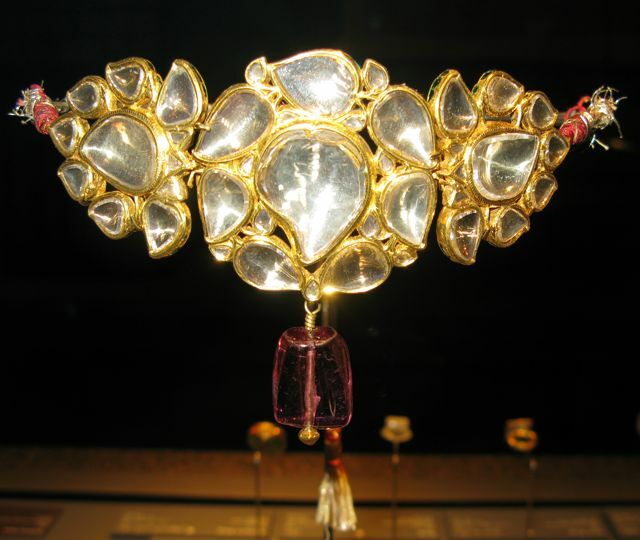 The original owner of much of the jewelry in the museum was Shah Jahan, who built the Taj Mahal. 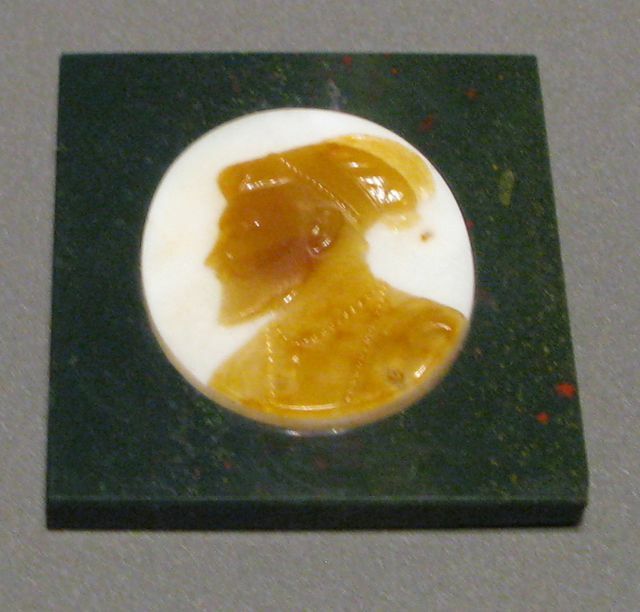 He is depicted here on a cameo in sardonyx stone on a bloodstone mount (ca. 1630). On my way home, evening views of Dhow harbor with ancient boats and modern high rises in the background. 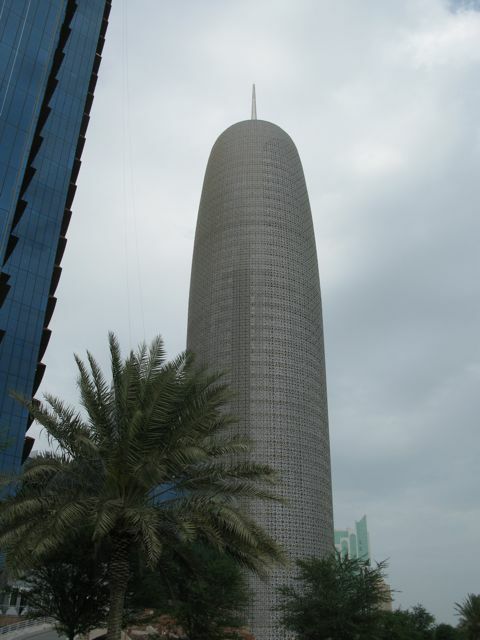 And as I approached the north end of the Corniche I walked right past the ‘corndog’ building again, past a black glass building that reflects the neighboring ‘monster’ buildings, and past the Qatar World Trade Center… Not sure what to think of this city. Corndog building (lights up at night) also goes by other less flattering names, but is really named Burj tower. 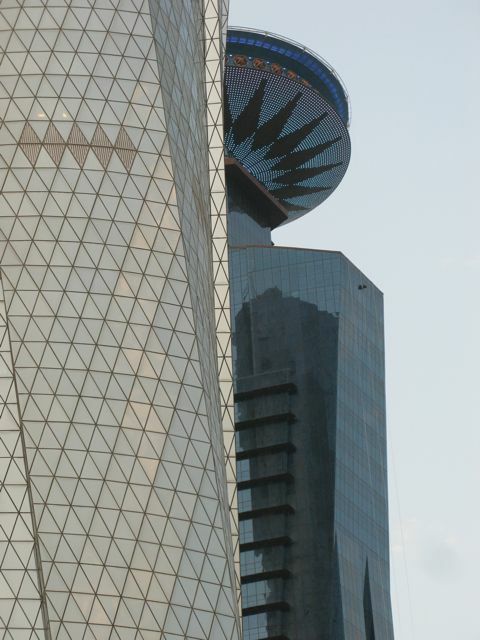 Qatar World Trade Center with crown! This entry was posted in Gemology, Jewelry, Travel, Uncategorized and tagged antique, art museum, diamonds, doha, Gemology, gems, gold, islamic art, Jewelry, necklace, precious metals, qatar, ring, travel. Bookmark the permalink. You could be a journalist – a really informative post! Thanks. Glad I don’t have to do this for a living! Great work mate! Looks like fun and well written. Spoken like a true Aussie. Thanks Anthony. Very interesting David. Thanks for sharing. I don’t know anything about this country and now I do. How are women treated there? Thanks for your comment and question. In regards to women in Muslim countries…that is complicated for Western folks to understand. I liked a book called In the Land of Invisible Women.